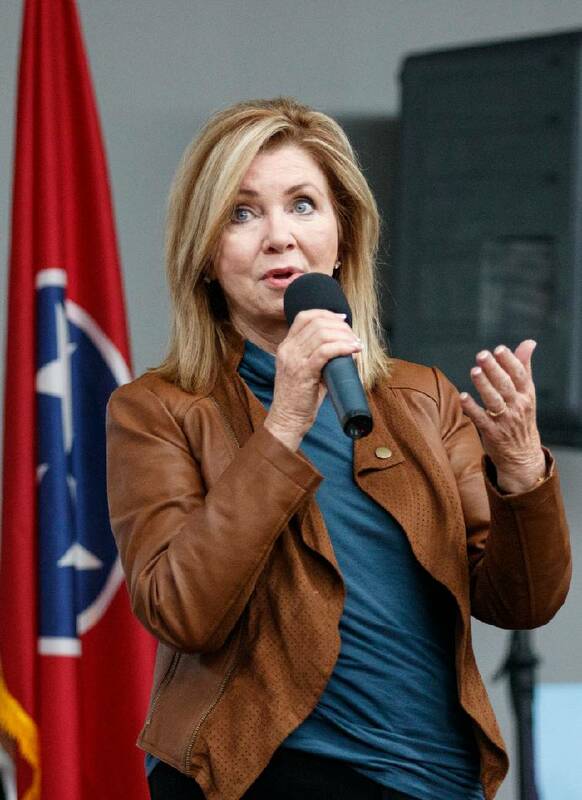 U.S. Senatorial candidate Marsha Blackburn speaks during an appearance at East Ridge Motors on Saturday, Oct. 27, 2018, in East Ridge, Tenn. Blackburn appeared at the campaign event along with U.S. Rep. Chuck Fleischmann and representatives from the Family Research Council. Source: Power Poll surveys 1,767 civic, community, political and business leaders online. The results are based upon 609 responses. Nearly two thirds of the top leaders in Chattanooga say they are voting for Democrat Phil Bredesen to succeed outgoing U.S. Sen. Bob Corker, but a majority of those local leaders still think Republican Marsha Blackburn will win in next Tuesday's election, according to a new Power Poll of business, civic, media and political leaders in Hamilton County. 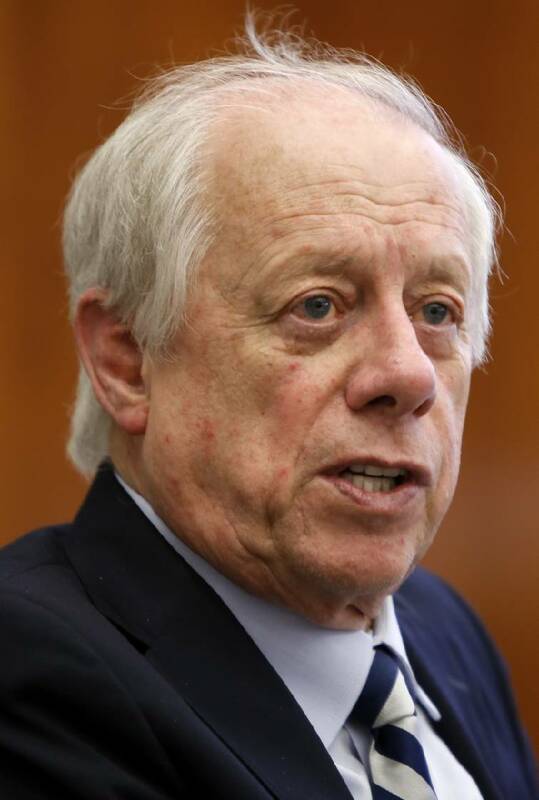 Bredesen, a former Nashville mayor and former Tennessee governor, was favored by 64 percent of the Chattanooga leaders. Blackburn, a former state senator who has served in the U.S. House of Representatives for the past 16 years, was supported by 35 percent of the local leaders in her bid to move to the upper chamber of Congress. But 53 percent of the Chattanoogans responding to the Power Poll predicted Blackburn would be elected. Blackburn, a Brentwood Republican, has been gaining favor in the most recent public opinion polls and could get a boost this weekend from a campaign rally in Chattanooga on Sunday by President Donald Trump on her behalf. The Real Clear Politics average of recent statewide polls in Tennessee shows Blackburn has a 6.8 percent advantage over Bredesen. Bredesen is the last Democrat to win a statewide race in Tennessee, when he won re-election as governor in 2006. But Bredesen, now 75 years old and facing a state that is increasingly turning red, faces an uphill battle to offset the GOP leanings of most of Tennessee, according to Bruce Dobie, founder of the Power Poll. Former Governor and senate candidate Phil Bredesen meets with the Times Free Press editorial board in the newsroom on Tuesday, Feb. 20, 2018 in Chattanooga, Tenn.
Trump carried Tennessee in the 2016 election by a 26-point margin, and Blackburn has repeatedly highlighted her support for and from the president. The Power Poll surveys elected officials, business executives and civic and media leaders in Tennessee's four biggest cities. Statewide, Bredesen enjoys even stronger support in the other major cities among those leaders surveyed, most of whom think he will win in Tuesday's election. Despite recent public opinion polls showing Blackburn with a slight lead among voters, the Power Poll respondents in the four major cities favored Bredesen over Blackburn by better than a 3-to-1 margin. Among the 1,767 opinion leaders surveyed in the Power Poll, 77 percent favored Bredesen, compared with only 21 percent who were voting for Blackburn. Statewide, despite public opinion surveys to the contrary, 53 percent of the statewide Power Poll respondents think Bredesen will win. "This points to a stark urban and rural divide in the state of Tennessee," Dobie said. "We're about to determine who is right." Ethnic voters who tend to favor Democrats are concentrated in Tennessee's biggest cities, and Dobie said many of the wealthy, establishment figures who Trump has widely decried were also included in the Power Poll. "Maybe those who are running our biggest cities listen to Trump and hear things that may appeal to the masses, but they don't like what is being said and are therefore going to vote for a Democrat this time," he said. In a similar poll last month, a majority of the influential leaders in the major cities said they are voting for former Nashville Mayor Karl Dean over Williamson County farmer and businessman Bill Lee to be the next governor. But in that poll, a majority of respondents still predicted that Lee will be elected. The Power Poll is an interactive survey targeted to powerful, influential people. Members are capable of steering a city's, or state's, discussion one way or another. The poll is not scientific. But it is designed to offer an insightful barometer into what community leaders think about current issues and events.